Thanks to James Perih for the screen shots! The OS/2 operating system was originally developed as a combined effort between Microsoft and IBM. After OS/2 Version 1.3 Microsoft and IBM split up. Microsoft went on to create Windows NT and IBM re-wrote OS/2 to produce version 2.0 and later versions. OS/2 Warp 4 was released on September 25, 1996. While this was quite a while ago, IBM and others still release patches, fixes, and add-ons to OS/2 Warp 4 to keep it up to date. More recently, in 1999, IBM released "OS/2 Warp Server for E-Business", a newer more advanced version of OS/2 (but intended for servers, not client PCs). The OS/2 Warp 4 Boot screen. This is the OS/2 Warp 4 desktop. Like many desktops you can store files and folders right on the desktop. 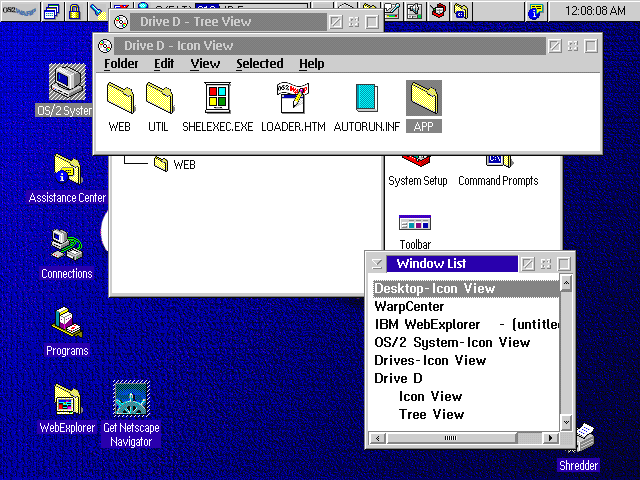 The icons shown above are the standard icons placed on the OS/2 desktop. 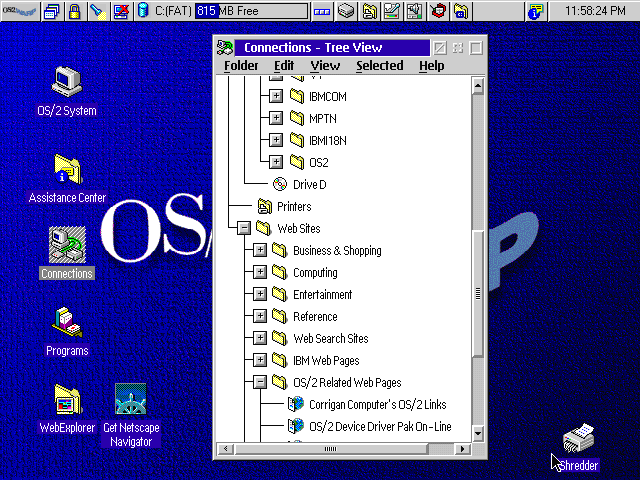 The OS/2 System folder, when opened, contains options and tools used for configuring and managing OS/2. The Assistance Center folder contains help files and Internet links to information relating to the use of OS/2. Connections contains local drives, printers, the local network connections, and internet connections. The Programs Folder opens an icon view of programs that are installed on the system. WebExplorer is a basic web browser that ships with OS/2 Warp 4. The shredder is used for deleting files, however unlike a Trash or Recycle Bin icon, the shredder immediately deletes the file and does not store a copy for retrieval later. Oddly the right mouse button is used for dragging icons by default, rather than the left mouse button. This behavior can be changed. The Window List displays a list of open windows that you can select. 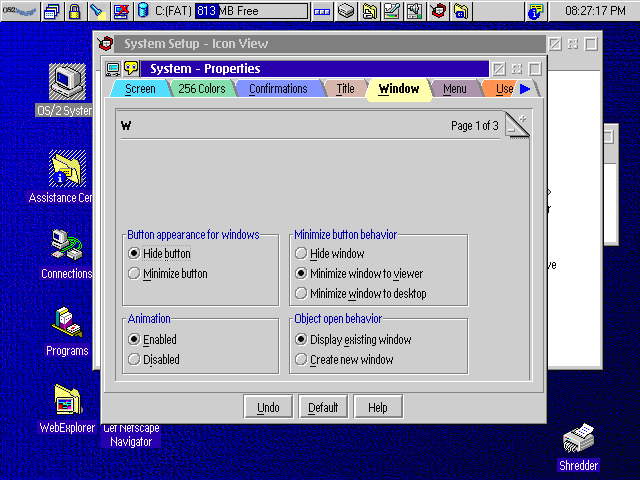 In Os/2 minimized windows DISAPPEAR instead of float to the bottom of the screen by default and you would need to use the Window List to retrieve it. The OS/2 desktop can also create shortcuts to items, except here they are referred to as "shadows" (and are actually more advanced, more like MacOS aliases). A typical Warp 4 tabbed dialog box. Each tab may have more than one page. Interestingly there is no "ok" or "apply" button. Settings are saved when the dialog box window closes. Folder windows may be viewed as icons, a tree view of other folders, or as a detailed list of files. In this example the connections folder is being viewed as a tree.